At Scientific Dust Collectors, we place a different emphasis on filter media than our competitors. 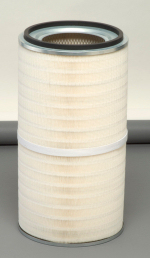 While most manufacturers continue developing filter media with better dust loading and permeability, which definitely has its place, the most critical aspect is very often over looked. At SDC, we believe that the emphasis should be focused on the cleaning system and how effectively and efficiently the filter media is cleaned. Our strategy is based on how well you clean the media so that it is reusable, and not how much media you have in a collector. Using our patented supersonic nozzle technology, we are able to clean both bags and cartridges better than the competitors. Because of this, Scientific Dust Collectors can operate at higher air-to-cloth ratios using less filters and provide longer filter life.